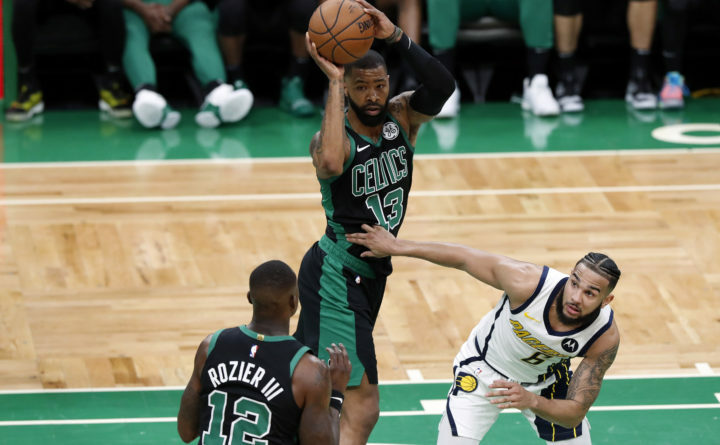 Boston Celtics' Marcus Morris, top, looks to pass the ball past Indiana Pacers' Cory Joseph during the third quarter in Game 1 of a first-round NBA basketball playoff series Sunday in Boston. Irving and Marcus Morris each scored 20 points, and the Boston rallied in the second half to beat Indiana Pacers 84-74 on Sunday in Game 1 of their first-round playoff series. Pacers: Went 12 of 21 from the free throw line (57). In his first playoff game as a Celtic, Irving became just the third player in franchise history to have 20-plus points, five-plus assists and five-plus rebounds in his postseason debut with the team. He joined Isaiah Thomas in 2015 and JoJo White in 1972.